SHANGHAI (Reuters) – China’s yuan closed at its weakest in over a decade on Monday, losing 0.16 percent to end the domestic session at 6.9560 per dollar <CNY=CFXS>, stirring speculation over whether the central bank will tolerate a slide beyond the key level of 7 per dollar. Broad dollar strength, as concerns swirl over risks of a global economic slowdown, was the main influence in the currency market, and there are growing expectations that the yuan could breach 7 per dollar in coming months, a level last seen during the global financial crisis. 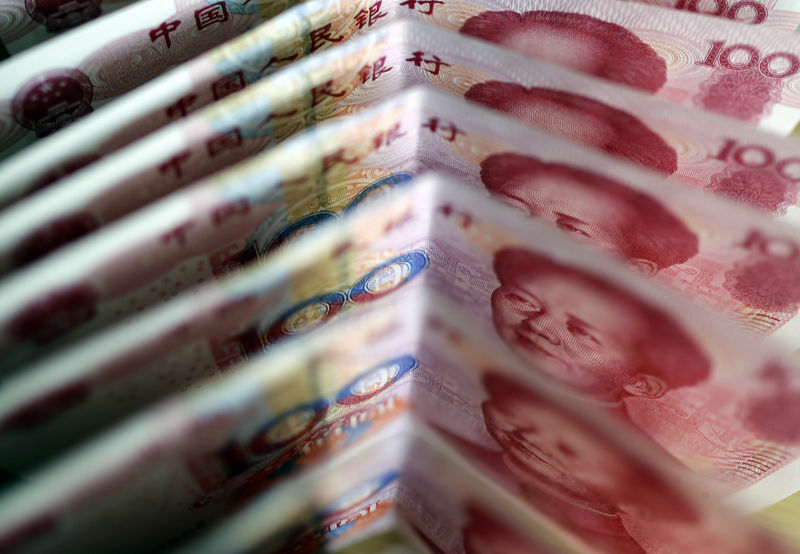 During intra-day trade on Friday the yuan had struck a 22-month low of 6.9647, before rallying on verbal support from a senior central banker. “For currency flexibility, it’s not absolutely unacceptable for the to go beyond 7, especially when the dollar strengthens like now,” Larry Hu, chief China economist at Macquarie in Hong Kong, said in a note. He expected the central bank’s reaction to be guided by trends in capital outflows. Policy insiders told Reuters on Friday that China is likely to use its vast currency reserves to stop any precipitous fall through the psychologically important 7 level as it could risk triggering speculation and heavy capital outflows. Prior to the spot market’s open, the People’s Bank of China (PBOC) set the midpoint rate <CNY=PBOC> at 6.9377 per dollar, 133 pips or 0.2 percent firmer than the previous fix of 6.951 on Friday. However, major state-owned banks, which usually act on behalf of the central bank to prop up the , did not appear to be selling dollars on Monday, some traders said. “The central bank is likely to keep the yuan at firmer than 7 level before the midterm election in the United States (on Nov. 6) but it will continue to test market’s reaction to further depreciation in the yuan,” said Ken Cheung, senior Asian FX strategist at Mizuho Bank in Hong Kong. Last week, the yuan weakened 0.23 percent against the dollar, but on a trade-weighted basis , it rose 0.18 percent against a basket of its trading partners’ currencies, according to official data from the China Foreign Exchange Trade System (CFETS). The index, published on a weekly and monthly basis, stood at 92.32 on Friday, CFETS said on its website.